Green Carpet Growing has home grow kits for you to get started growing weed, cannabis and marijuana indoors. We carry complete indoor grow tent kits with LED for soil growing as well as “grow as you go” hydroponic grow kits. Your Green Carpet Growing home grow kit will have everything you need to grow at home during all phases of cultivation. Don’t settle for grow tent kits with untested LED lights, or grow tents with low-grade seams and easily breakable zippers. Rather, do it right from the beginning with quality equipment and supplies. Green Carpet Growing invites you to save time, energy and money with our complete indoor grow kits. 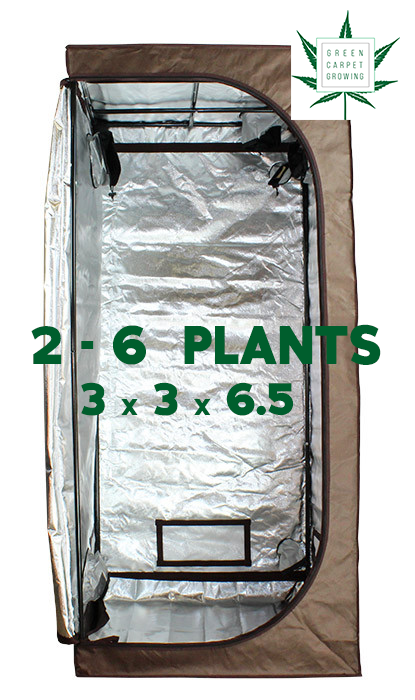 Q: How many plants can I grow with your complete grow tent kit package? A: With our 3 x 3 x 6.5 Grow Tent, you can grow 2 – 6 plants. For instance, you can have 6 pots on the smaller side, or 2 large pots. It’s up to you – there is no right or wrong answer, however, we encourage you to experiment until you find what is right for you. Q: Does your home grow kit include set-up assistance? A: No, but you may hire Green Carpet Growing to set up your grow tent kit for an additional fee. Q: Does your LED Light come with a warranty? A: Yes. A 5 year warranty is provided to replace or repair your light should any defect occur. Q: How effective is your LED Light? A: The LED Light in our grow kits have a reputation as being high quality and best-in-class. Q: Am I am able to see the grow kit in person? A: Yes, if you are located in San Diego, we are able to show you the grow kit in person via appointment on Monday thru Saturday. We are also able to coordinate video appointments using Skype, Google Hangout or Whatsapp. Q: Does your grow kit come with filters to eliminate odor? A: No, however we can add a filter to your grow kit if maintaining an odorless environment in your home is desired. They are easy to implement and extremely effective. Q: Does your grow kit come with cultivation instructions on how to grow weed, cannabis and marijuana at home? A: Grow guides are not included, but you may purchase a customized grow guide, take a grow class or receive in-home personal instruction. Learn more by contacting us!